New design - hanging water panel feel, features elegant polished stainless steel floor fountain with a center mounted clear glass water panel. 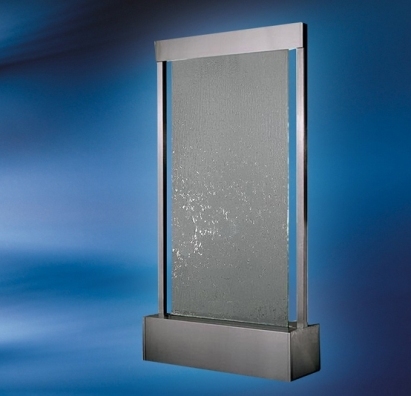 The 8mm thick tempered glass water panel with narrow basin – only 250mm deep, allows obscured viewing from both sides and clear viewing when the waterfall is not operating. Self contained re-circulating waterfalls which do not require any plumbing and easily installed. A custom logo etched on these fountains makes a memorable statement in any lobby or entryway, contact one of our custom sales representatives for artwork requirements and pricing.